Through the end of this month ReviewMe is offering advertisers 50% off. 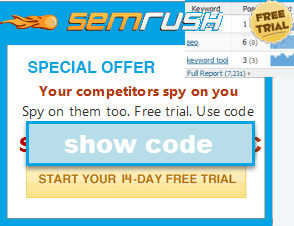 For advertisers to use the 50% off coupon they simply have to enter: trial into the coupon code at checkout. And don't post full text rss. The entire purpose of RSS on blogs is to alert subscribers of new events/topics etc so that they come to the blog and interact. Blogs are the new forums. Well look at it this way...if people are subscribing to and linking to your Feedburner feed that does not build your link equity, but link equity of Feedburner, an already authoritative site. Plus if they are scraping full feed info from there that is no good either. fwiw, i like to click the link to bring me here. the colors make me happy. plus i aggregate from the google homepage. aaron couldn't get all his content in there anyway. in this fashion, i can click the article i want to read and not click the one's that i wouldn't want to read. AND by the way, lazy customer...there was i time i had my blogs with all content in the RSS until i woke up and realized i was giving pieces of myself away without the benefit of traffic, monetizing possibility, and sticky readership. that would be rss suicide -which i am currently commiting with the blog i linked to from my name cause i am too lazy to do anything about it. Just A Reader, get a decent reader! I don't have to "open up another browser". "So our biggest challenge is getting an advertiser to try it once. To encourage new advertisers we are offering a special coupon code that will give advertisers 50% off any review they purchase this month." So, my question is - can I use this coupon code multiple times after the first time if it's still within this month? Or, only for the first purchase? I didn't see anything specifically mentioning this on ReviewMe or on your original post or comments above. I didn't see anywhere to type in a promo code, and ordered the review anyways while sending a note to reviewme asking about the trial. I hope they don't charge me the full $250..They never wrote back. I forwarded your comment along, so you shouldn't be charged the full $250. Like Matt I never received a reply back from anyone at ReviewMe concerning the question I had above about using the coupon code more than once as long as it's this month. What's worse is I filled out the contact Form on ReviewMe to receive a custom quote because I have several big clients that want to spend thousands on getting their name out there. No one has answered from ReviewMe on that either. Not very promising or reassuring considering I want to spend thousands... Is everyone on permanent vacation over there? Aaron, I really enjoy your blog but I read 60 other blogs in my rss reader. It would make it much easier to read your blog if you provided full content within the feed. There really isn't a reason to force us to visit your site unless you are trying to make additional cash off of advertising. I only read 10% of your post because you insist on making your users who read through RSS to open up another browser. Are you going to ever be offering discounts like this again? because i am planning on using review me for a new site im launching in about 2 months. Just A Reader: Traffic people get to their blogs helps them make a living and write more content. The sole purpose isn't neccessarily to make life easier for someone too lazy to click on a link. I can't guarantee that we will be doing one to this scale again, but some other discount offers may occur once in a while. Spot on Eddie. If people are too lazy to click a link they are not my target market. Full feed RSS distribution = duplicate content central. And if I am penalizing my site to cater to the lazier and less initiated portions of the market then I lack common sense. Aaron, I've been reading your blog for a year. I've purchased your book and have recommended your book and blog to many others. The fact you don't want to make reading your blog more convient for your readers says explains alot, the fact that you are willing to call a reader and customer lazy also explains alot. Remember the rule of customer service. For every one person that complains 100 other remain silent but equally upset. My blog is already scraped by tons of sites. Why would I knowingly run into all those duplicate content filters to make a few customers happy? If my blog doesn't rank in some search systems because I gave that content to automated content generation sites I would be an idiot who should not be blogging about SEO with ANY credibility. You may be a good guy, but anonymous Just a Reader labels are usually associated with people who are just trying to stir up crap. And the fact that you would throw something so far off topic in this thread rather than trying to contact me via email (which is easy to find if you bought my ebook) certainly says a lot about how much consideration you have for me. Some customers will never be happy and you can't please them all. The sun will come up tomorrow though. Guess I didn't fully understand the dynamics of why you choose to keep your content distribution limited. Anonymous or not, notice I did start with "Aaron, I really enjoy your blog..." and that your response started by suggesting that I was "too lazy to click a link"
I have a blog. People ask me questions that are off topic on my post once and awhile, what better place to address their concerns than in a public forum? I don't want to continue to hijack your thread. But had you addressed my question in your first response as clearly as you had in you last, this discussion would have been over by now. "Full feed RSS distribution = duplicate content central." But I guess I am sometimes guilty of thinking people understand me when many don't. I am so immersed in the web / search / blog / syndication stuff that I probably confuse a lot of people. It is a delicate balance that I have not mastered yet. I think I might just take advantage of this offer. Let me get this clear, linking to a full feed url such as Feedburner makes it more likely that a duplicate content filter will be weighed in? I'm not in the scraping business, however. I would rather my content be unique and driven by my member community. I don't mind the extra click by any means. I'll check out the Review Me promo - thanks.